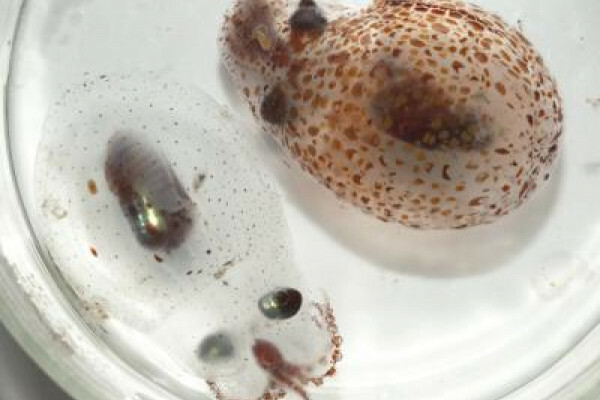 A new study has shown that some squid and octopus species are able to shift their colouration between being transparent and coloured, in order to camouflage against the bioluminescent searchlights of predator fish, and from producing a silhouette in downwelling light from above.In different depths of water, different camouflage strategies are most effective. In the mesopelagic - so mid-level waters - the best strategy is to be transparent, so most squid species here are not pigmented - so that they are harder for predators to spot, particularly from underneath - a dark silhouette against the sea surface is a bit of a giveaway.Down in the depths of the ocean however, there's very little light except from species with bioluminescent lures and searchlights. These would be reflected by a transparent body, so most species are coloured a dark red colour. But what if you're a species that lives in both the deep and mesopelagic zones? Adapting to one of the zones would make you vulnerable in the other. Well, Sarah Zylinski and Sönke Johnsen from Duke University in the United Statesreport that the two species that they studied - the octopus Japetella heathi and asquid, Onychoteuthis banksii - are able to shift between being transparent or coloured depending on depth.Both do this by expanding or contracting pigment containing cells calledchromatophores. When the two species were studied in a tank under ambient lighting, they both appeared transparent, but when a blue light was switched on and directed at them, to mimic the bioluminescent searchlights found in many deep sea species, they were seen to rapidly expand their chromatophores and take on a scattered deep red pattern.When reflectance of the surface of Japetella was measured, it was foundthat it reflected twice as much of the blue light when transparent as when thechromatophores were expanded. So when trying to hide from a predator with abioluminescent searchlight, it pays to be able to turn on your pigment cells, so theirsearchlight doesn't reflect back off you. But when they go back up into shallowerwaters, these species can shrink their chromatophores once more and take on the safer transparent form.